Did you know that June was National Mago Month? No really, it was! And even though June is over mangos are still at their prime. If you have ever wondered about mangos look no further than the article below that I wrote for meal planning/recipe site Food on the Table. And defiantly make these Grilled Paradise Pork Chops before summer is over or you will be regretting it all winter long! Juicy and flavorful, mangos have long been a popular fruit! Mangos are often described as a blissful, exotic mix between pineapple and peach. And while mangos are available from April till September, they are at their prime and most flavorful, not to mention best prices, in the months of June and July. This makes them a succulent summertime fruit! Nutrition: Mangos are rich in vitamins, minerals, and anti-oxidants. They are an excellent source of Vitamins A and C, as well as potassium and beta carotene. Mangos are also high in fiber, containing up to 40% of the daily recommended fiber requirement. Mangos are unique in that they contain a special enzyme with stomach soothing properties which help as a digestive aide. Selecting: When selecting a mango, choose one with a tropical, fruity aroma, as unripe mangos will have no scent. Also a fresh ripe mango will be slightly soft to the touch, however, avoid mangos that are overly soft or bruised. Depending on the variety of mango, it will ripen to a red, orange, yellow or green shade. Storing: Unripe mangos should be stored at room temperature. However, once ripe, mangos should be stored in the refrigerator for five to seven days; while peeled and cubed mangos can be frozen for up to six months. Cutting: Cutting a mango may seem intimidating but really it is not. To cube a mango, cut lengthwise down both sides of the pit. Using a paring knife, cut ½ inch squares by scoring the mango, making sure not to cut through the skin. Turn the scored mango half inward pushing apart the cubes. The use the paring knife and cut the cubes off the mango. Mangos can be enjoyed in a variety of ways. From sweet dishes such as smoothies and sorbets to savory dishes like salads, salsa or marinades. Looking to enjoy this exotic fruit this summer? 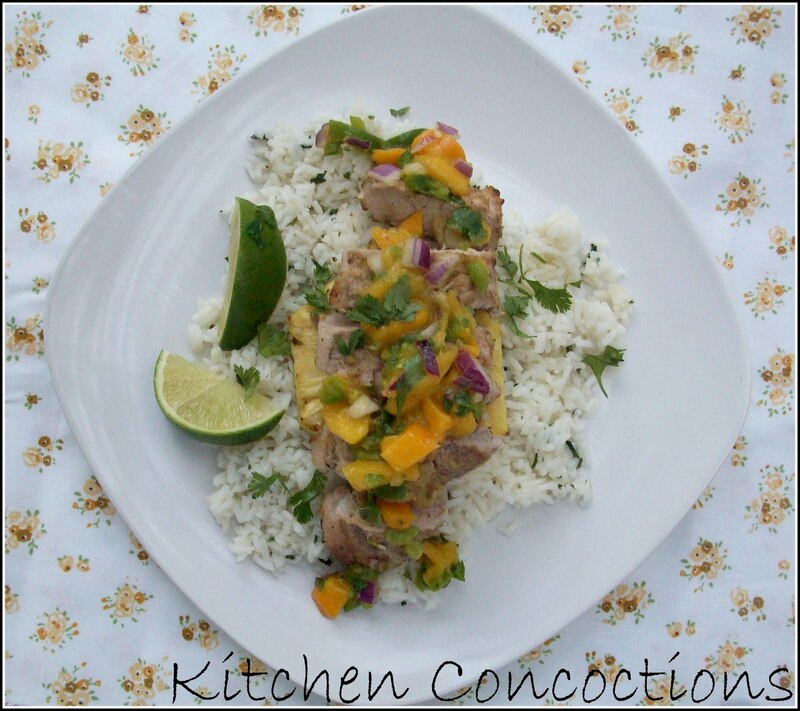 Well try this Grilled Paradise Pork Chops, no beach required! Prepare and mix all salsa ingredients together. Place half of salsa mixture in blender and puree; reserving remaining salsa for later use. Place pork loin chops in large zip top bag. Pour pureed salsa mixture over pork chops and toss to coat. Let pork chops marinate in salsa mixture for 45 minutes. Preheat grill to medium heat. Lightly oil grill grate and place marinated chops on grill and cook for 8 minutes per side or until they reach an internal temperature of 145 degrees. When pork chops are done cooking remove from heat and let rest for 5 minutes. Top pork chops with remaining reserved salsa and serve. 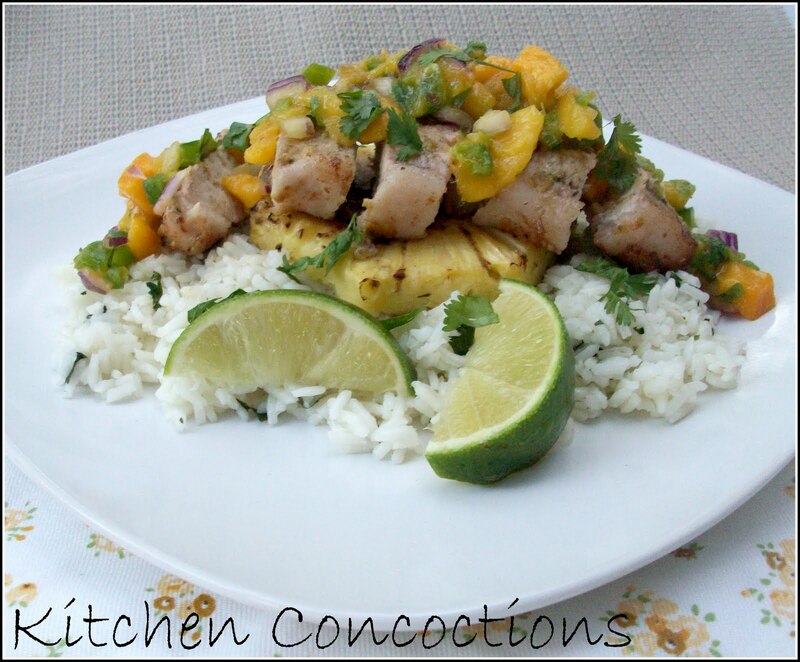 I LOVE mangoes and this recipe sounds amazing!